Team Talk. 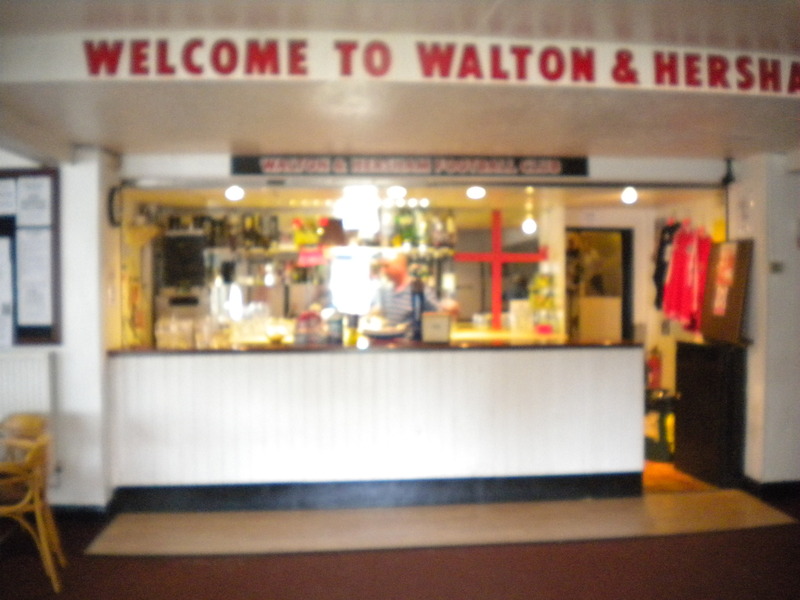 Walton and Hersham were formed from the amalgamation of Walton FC and Hersham FC in 1945. 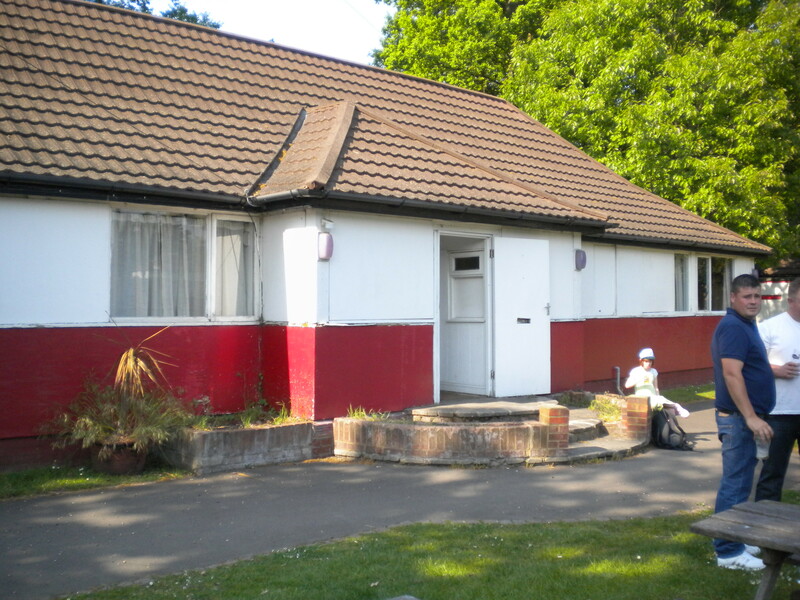 The club’s notable achievements include winning the Corinthian League in three consecutive seasons between 1947 in 1949 and impressively winning the FA Amateur Cup in 1973. More recent times have seen the team yo-yo between the Isthmian Premier Division and the Isthmian South Division, where they currently play. Today’s game against Dulwich Hamlet was a chance for one of the clubs to secure the final play-off place in the division (5th). Before kick-off Dulwich were in the driving seat, equal with Walton and Hersham on points but with a superior goal difference. The chances of Burgess Hill (the remaining team who could mathematically secure 5th place) leapfrogging both teams seemed unlikely on recent results, so all eyes were on this fixture. There was some pre-match chat about the fairness of the play-offs, as it can be argued that a league is played over thirty some games and that promotion should be the reward for the teams that have secured the most points over the course of the season. The play-offs allow seemingly less deserving teams to secure promotion. This point is highlighted by the fact that the team that would take 5th place today would finish some thirty points behind the 2nd place finisher who would also go into the play-offs. While I can see the arguments here, personally I feel that the play-offs assist in keeping leagues as competitive as possible for as long as possible. This is ultimately a good thing for the league itself and the clubs, particularly in the non leagues where the bigger attendances achieved for more important games make a real difference in financial terms. 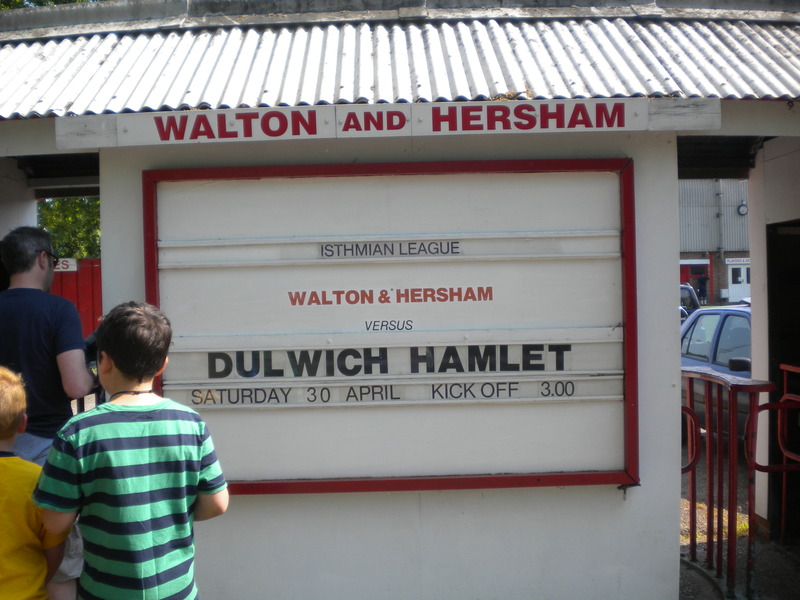 Walton and Hersham are currently managed by former Dulwich Hamlet player Chuck Martini (or Chuck Norris as he has been hilariously referred to on Wikipedia). It is also worth noting that paper and pen magnate Theo Paphitis is one of the directors of the club, giving the team a link with the league’s main sponsor Rymans the stationers. It is safe to say that Walton and Hersham will never be short of free biros and ink cartridges. Home advantage. 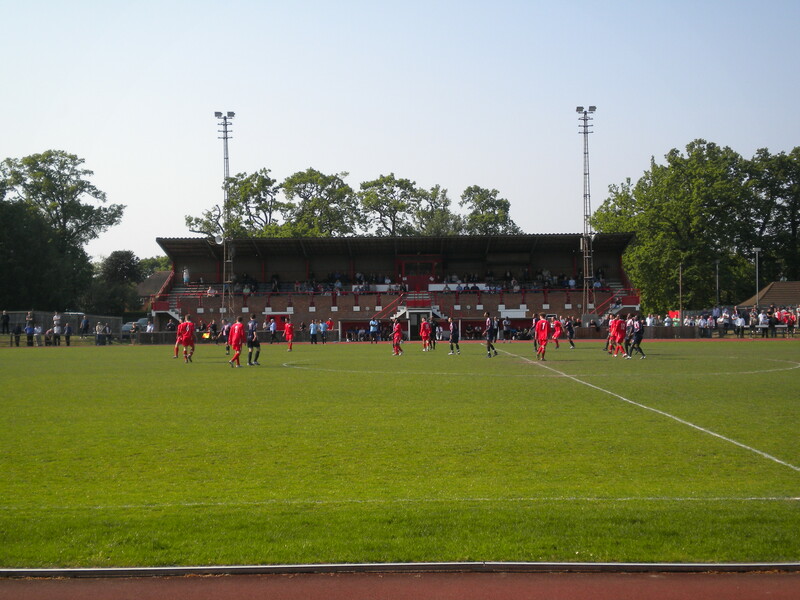 Walton and Hersham play at Stompond Lane sports ground, which is located in a leafy part of this London suburb that can be best described as well-to-do. The sports ground itself is separated from the main road by the car park, tennis court and a small turnstile building and club house that have something of the Hi-di-hi -holiday camp about them that I quite like. 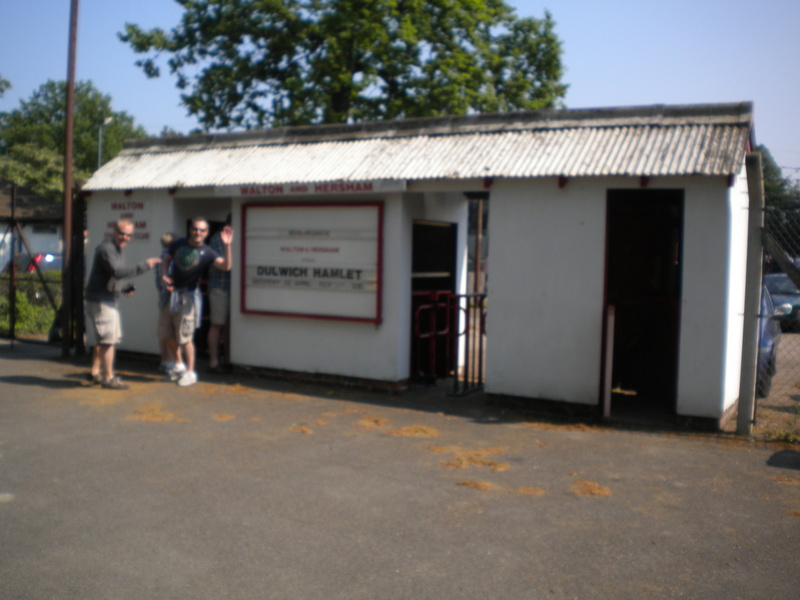 The turnstile building had a notice board on it advertising the day’s fixture, with the name of the away team printed in much larger type, quite the welcome. 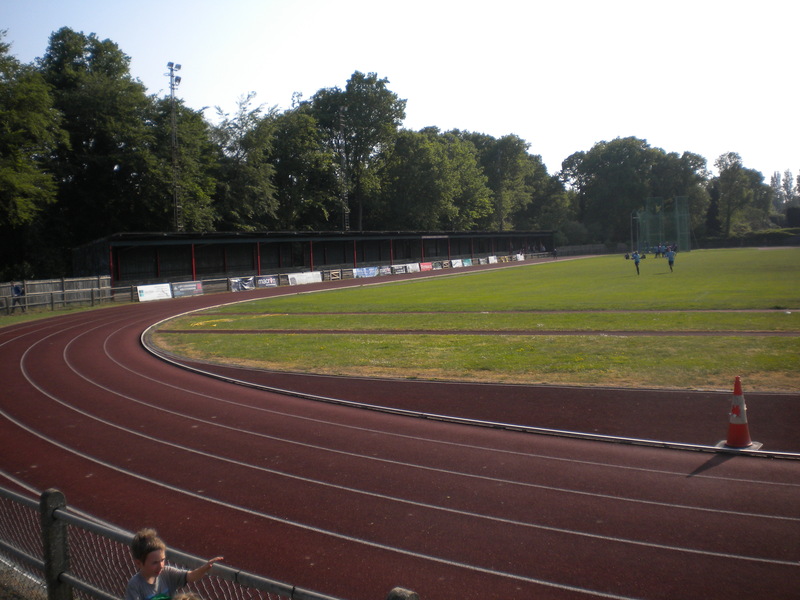 The main feature of the playing arena is the running track that separates the pitch from the stands. The track is part of the multi-use sports function that the arena performs, which also includes a hammer throwing net. Recent news stories about the use of the London Olympic stadium (with its own running track) for football has made it fashionable to see running tracks and football pitches as completely incompatible and a threat to the atmosphere of a football game. With this in mind, I went to Walton and Hersham prepared to dislike this feature. However, I personally felt that it made no real difference to the overall atmosphere although the track makes standing behind the goal a difficult proposition due to the distance between the flat and open standing ends and the action. 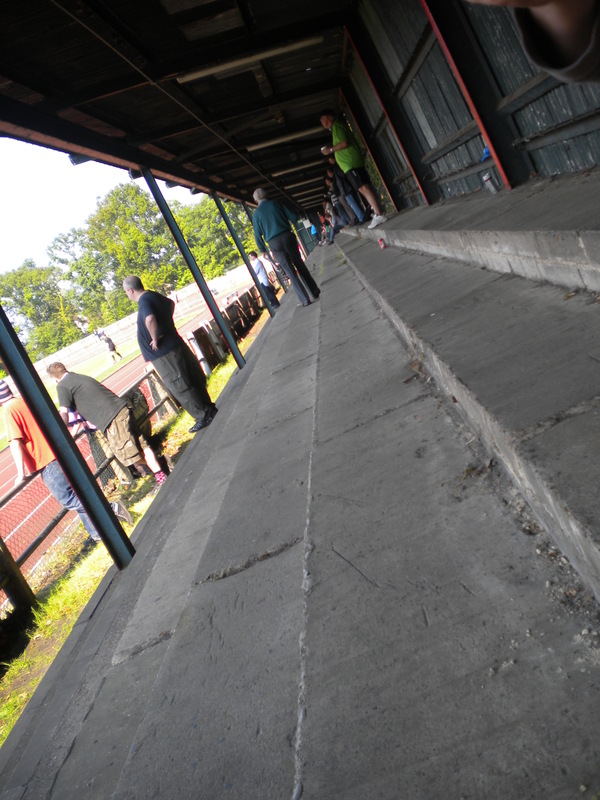 The pitch is flanked on one side by a large seated terrace and on the other by a pigeon stand that runs the whole length of the pitch, probably the prime spot to watch the game. Park the bus. Hersham train station is a few stops outside the London zones and is reached by direct and frequent trains from Waterloo, taking 25 to 35 min. Prawn sandwiches. 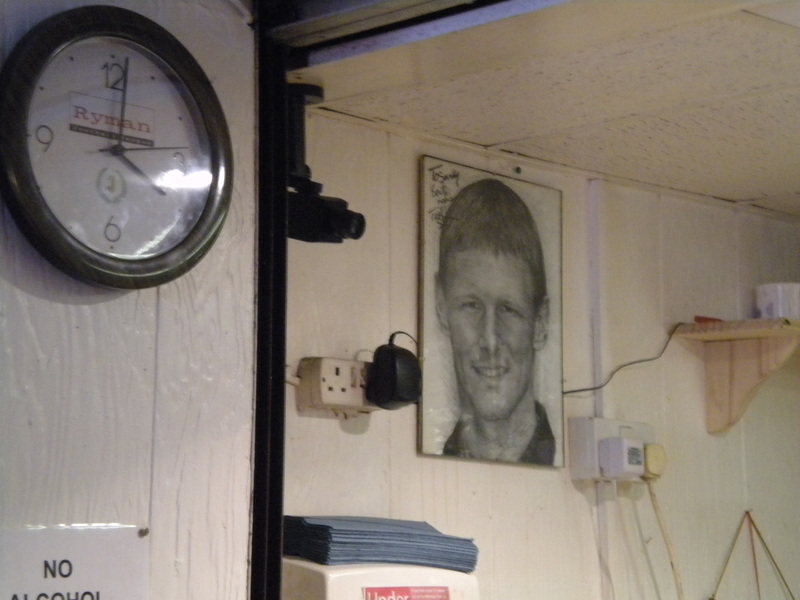 The clubhouse has fairly standard offerings in terms of ale and clearly has some sort of link with Tottenham Hotspur, evident from the sketch of Teddy Sheringham over the bar and the signed Spurs shirt at the entrance. There is also a burger van. 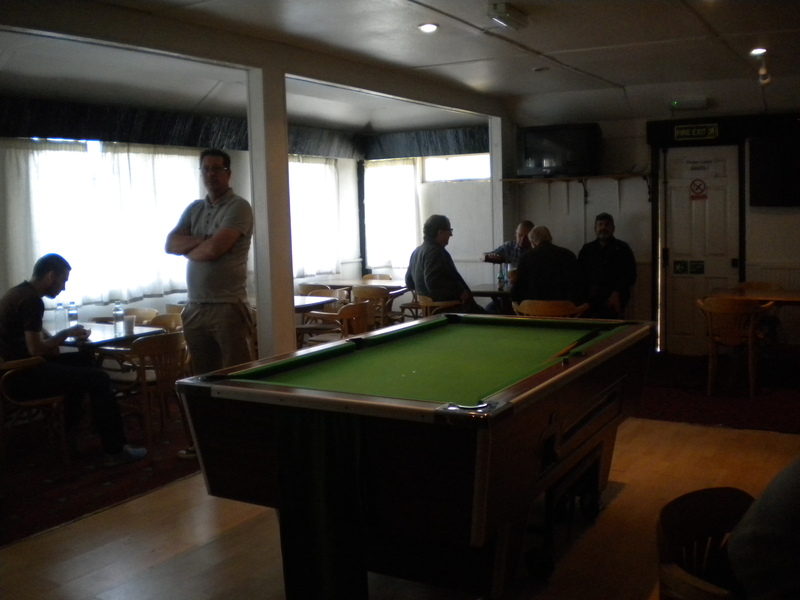 …..and the game. 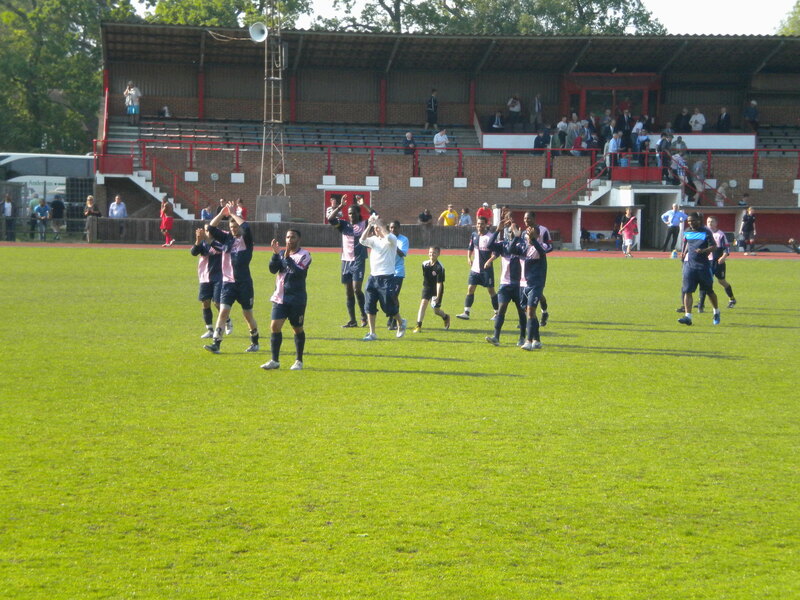 As a follower of Dulwich Hamlet I was of course delighted with the result. Truth be told, I’m sure that both teams have turned out better performances. Walton and Hersham never really looked like troubling the Hamlet, which I think gave the away team the necessary confidence to put on a more attacking display in the second half. Man of the match. I went to the game with some nerves about the outcome. Such nerves can be broken only by moments of pure comedy. This comedy was duly delivered early in the game by the spectator who was leaning against a timber fence that gave way, resulting in him falling through it. Fair play, the guy picked himself up and continued watching the game like nothing had happened. Post game rub down. 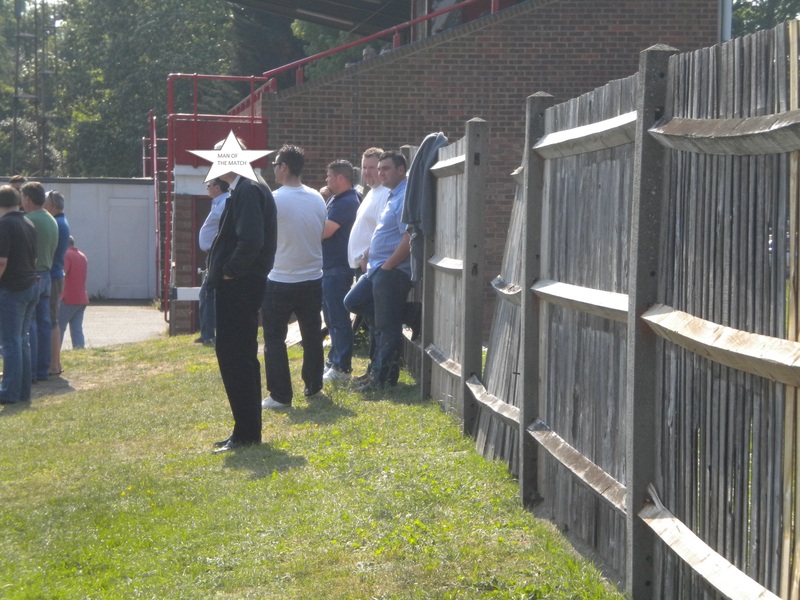 Waltham and Hersham seemed like a solid local club with a friendly support, happy to mingle in the clubhouse afterwards with the away support despite what must have been a disappointing result and performance for them.